SINGAPORE (Feb 2): Oil prices fell for a second session in Asian trade on Tuesday as worries about top energy consumer China and rising oil supply weighed on markets, although possible talks between OPEC and Russia on output cuts offered some support. Brent for April delivery had dropped 32 US cents to US$33.92 a barrel as of 0757 GMT, after settling down US$1.75, or 4.9%, in the previous session. The front-month contract for West Texas Intermediate (WTI) was down 27 US cents at US$31.25 after falling US$2.00, or 5.9%, the session before. Despite the declines, US crude is still nearly 19% above the more than 12-year low of US$26.19 hit in mid-January. The fall in oil prices reflected the general negative sentiment in the Asia time zone, said Ric Spooner, chief market analyst at Sydney's CMC Markets. "Stocks markets are down; oil is weakening. It all points towards negative risk sentiment across the board," he said. MSCI's broadest index of Asia-Pacific shares outside Japan was down about 1%, while Japan's Nikkei closed down more than 0.6%. The dollar index also slipped. "(Prices) have just come back to reality a bit, although they are holding water above US$30 a barrel," said Ben Le Brun, market analyst at Sydney's OptionsXpress, pointing to concern over rising oil supplies and weaker economic data. Oil prices could nudge below US$30 a barrel again if investors saw hopes fading of a deal between members of oil producers cartel OPEC and Russia on production cuts, he said. Russia's energy minister and Venezuela's oil minister discussed the possibility of holding joint consultations between OPEC and non-OPEC countries in the near future, the Russian Energy Ministry said on Monday. That came as Russia's oil output rose to 10.88 million barrels per day (bpd) in January, up from 10.83 million bpd in December, Energy Ministry data showed on Tuesday. But Goldman Sachs said it was "highly unlikely" OPEC producers would co-operate with Russia to cut output, while also being self-defeating as stronger prices would bring previously shelved production back to the market. Crude prices fell after China's purchasing managers index dropped to a three-year low in January, coupled with climbing oil supplies, ANZ said in a note on Tuesday. "Rising supply also suggests further downside risk to short-term prices. Output from OPEC rose to 33.1 million barrels per day last month as Indonesia's membership to the group was reactivated," the note added. Investors are waiting on a slew of economic data, including US non-farm payroll and unemployment figures and producer prices from the euro zone, to give oil markets further direction, Le Brun added. US commercial crude oil inventories likely rose by 4.7 million barrels last week to a new record high of 499.6 million barrels, a preliminary Reuters survey taken ahead of industry and official data showed on Monday. 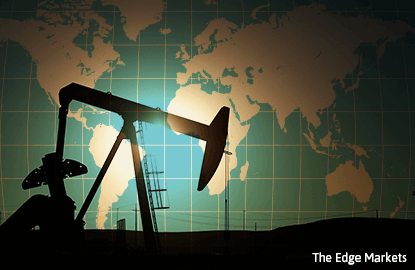 The Reuters poll was taken ahead of weekly inventory reports from industry group the American Petroleum Institute (API), due out later on Tuesday, and the US Department of Energy's Energy Information Administration (EIA), due for release on Wednesday.